Mineral Tramways is one of the largest programmes of its kind in Britain. They can be used by walkers, cyclists and equestrians. Three trails are - the Coast to Coast Trail, the Great Flat Lode Trail and the Tresavean Trail. 60km (37 miles) of trails for recreational walking, cycling, horse-riding and educational uses. The network of trails is free to use and open all year. Other facilities on or near the trails include information centres, car parking, toilets, refreshments, cycle hire and riding stables. From Hayle and Portreath to Devoran, the trails connect to other routes including The Cornish Way, the South West Coastal Footpath and historical houses such as Tehidy, once part of the estate of the Basset mining family and now a Country Park. In the early 19th century, Cornwall was at the forefront of the Industrial Revolution and its engineering and mining expertise contributed to world-wide technological progress. The Great Flat Lode area is one of the world's best conserved mining landscapes. Now Mineral Tramways is officially recognised by the Council of Europe as a 'Cultural Route'. 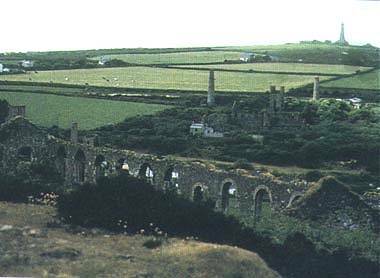 In the future, Mineral Tramways is part of the World Heritage Site proposed for Cornish Mining between 1800 -1860. 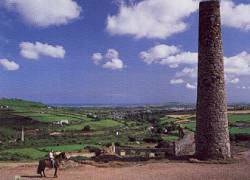 The heyday for mining in Cornwall was 1750-1850. At this time the mines employed large numbers of men, women and children. Life was comparatively cheap and underground conditions resulted in early death for many miners. Women were never employed underground, instead they worked on the surface as balmaidens, breaking up ore. Children worked on the tin dressing floors and underground. 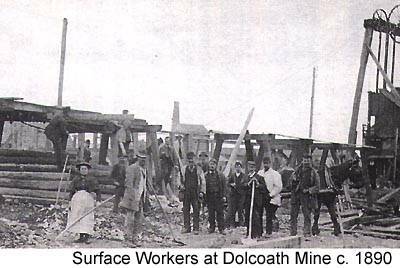 Through the busy ports of Portreath, Devoran and Hayle coal, timber and other mining supplies were brought in and unrefined copper ore shipped out. Local foundries and engineering works also used the ports to supply mines around the world with parts, equipment and expertise. The speculative nature of mining meant economic booms and times of great hardship. When the copper and tin mining industry collapsed during the latter 19th century, an estimated two-thirds of Cornish miners emigrated overseas to find work in the Americas, South Africa and Australia, where mining was being opened up and their skills were required. This meant a massive loss of working age men and families from the county resulting in sweeping social and economic changes. a 10.5km (6.5 miles) circular trail around Carn Brea hill. It can be used by walkers, cyclist and equestriansThe trail at Basset Mines is suitable for access by the disabled. In the surrounding villages and the towns of Camborne and Redruth there is a good choice of shops, places to eat and links to public transport. Many buildings in the area were built from mining wealth - there are several town trails giving an insight into the history of the area which are well worth exploring. TRAVELLING BY CAR- Take the Camborne/Portreath/ Pool exit from the A30, and go left to Pool. At the crossroads, follow the brown signs for the 'Mineral Tramways Centre'. Pass South Crofty Mine on your right. Follow the road round to your left, turn right over the bridge towards Four Lanes. Take the next left and left again. The trail links the historic mining harbours of Portreath on the north coast and Devoran on the south coast. It closely follows the line of two early horse-drawn tramroads, the Portreath Tramroad and the Redruth & Chasewater Railway. A more strenuous 2mile/3km link via Wheal Busy and Hawke's Engine House is steeper and rougher than the rest of the trail, but worth the effort. 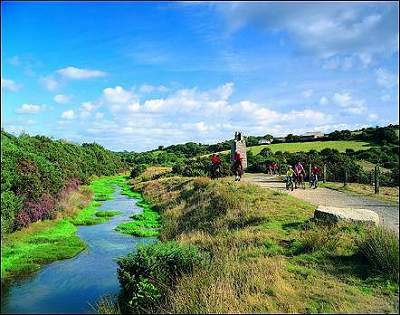 Walkers, Cyclists and horse-riders will discover varied countryside and many historic buildings amongst Cornwall's mining heartland. The trail is largely off-road, except for road crossings and several sections of quiet road. Huge granite stones with this symbol (brown engine house as shown for Portreath Tramroad) have been used as waymarkers and interpretation boards along the route feature's the area's 19th century mining heyday. Travelling by Car - From the A39Truro - Falmouth road, follow brown signs for cycle hire. The trail runs parallel to this road. There are car parks along the route (charges may apply). Elsewhere, roads are often narrow with no space for parking. Two Cornish Beam Engines, one for pumping the other for winding, on either side of the main road between Camborne and Redruth at Pool. A good starting point to find out what you can do in the area. Exhibition and shop. Follow brown signs from the A30. Owned by National Trust. Mineral display and monthly exhibitions by local artists. Restoration of tin streaming works in progress. Joint project with Cornish Goldsmiths. In the 19th century Carharrack, Lanner and St Day where at the heart of the Gwennap mining industry - once described as the then "richest square mile in the world". Now you can exlpore their fascinating past along three new trails. Small Cornish reference section. Statue of Richard Trevithick outside. Main Cornish reference collection. Books, articles and photographs. Useful for mining, transport and family history source material. Library and Research Centre for tracing family history. Quarterly journal for members. Small daily fee for non-members. Historical records for reference. Cornwall County Council. House and gardens. Nine miles of woodlands, lake and riverside paths. Events. Countryside Services, Cornwall County Council. Hayle Towans. Hayle. Tel: (01872) 322642. Extensive sand dunes with nationally important flora and fauna. 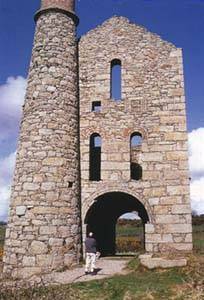 Dynamite Towans is the site of the old explosive factory and is found at Upton Towans. Free access. Details Cornwall County Council. An 11 mile/17.5 km trail for walkers, cyclists and equestrians. 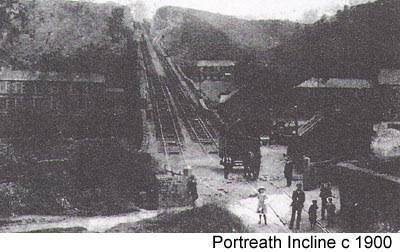 The trail links the historic mining harbours of Portreath on the north coast and Devoran on the south coast following the line of two early horse-drawn tramroads, the Portreath Tramroad and the Redruth & Chasewater Railway. A more strenuous 2 mile/3 km link to Wheal Busy and Hawke's Engine House is steeper and rougher than the rest of the trail, but worth the effort. Interpretaive boards on route highlight the area's 19th century mining history. 6.5km/10.5km trail for walkers, cyclists and equestrians. Interpretive boards and name plates at important sites and on interesting buildings. Information boards at Camborne and Redruth Libraries; The Countryman Pub, Piece; Brea Inn, Brea and Wheal Basset Inn, Carnkie.